You'll definitely find a pot of gold at the end of this rainbow of a snack... Even though I'm a grown adult, I love love love Lucky Charms. 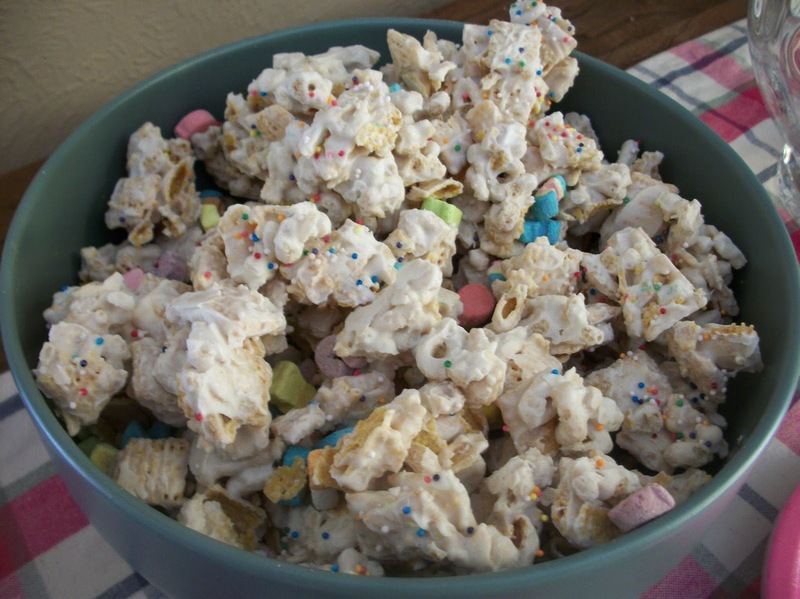 So I couldn't have been more thrilled to find a recipe for Lucky Charms Chex Mix....my favorite naughty cereal (that's what my family calls sugared cereals!) mixed with a healthy cereal, with white chocolate to keep it all together. St. Patrick's Day will never be better, once you make this delicious treat! Find more great stuff at Mouthwatering Monday, Inspiration Monday, Mix it Up, Totally Talented, Create Link Inspire, Clever Chicks, Try a New Recipe, Inspire Me, Tasty Tuesday, Full Plate, Showcase Your Talent, Friday Flash, Foodie Friday. Pour box of Lucky Charms out onto a large tray. Pick out all the marshmallows (about 2 cups); set aside to add to the mix later. Measure 2 cups of the remaining Lucky Charms cereal (without the marshmallows) into large bowl, add Chex cereal. In medium microwavable bowl, microwave white vanilla baking chips uncovered on High about 2 minutes, stirring every 30 seconds, until chips can be stirred smooth. Pour over cereal mixture in large bowl; toss to evenly coat. Stir in the marshmallow pieces. Spread mixture in single layer on a wax paper-lined cookie sheet. Immediately sprinkle with candy sprinkles. Let stand until set, about 20 minutes. Gently break up mixture; store in airtight container. Yummy! I bet these are so yummy! I'm going to give it a try for my kids. We will just love your Lucky Charms! Happy St. Patrick’s Day and thanks so much for sharing with Full Plate Thursday! How fun! Thank you so much for linking up at Tasty Tuesday! Your recipe has been pinned to the Tasty Tuesday Pinterest board! Please join us again this week!